'Tis the season to be jolly, and what better way to start off the Feast of Winter Veil than with a holiday giveaway! 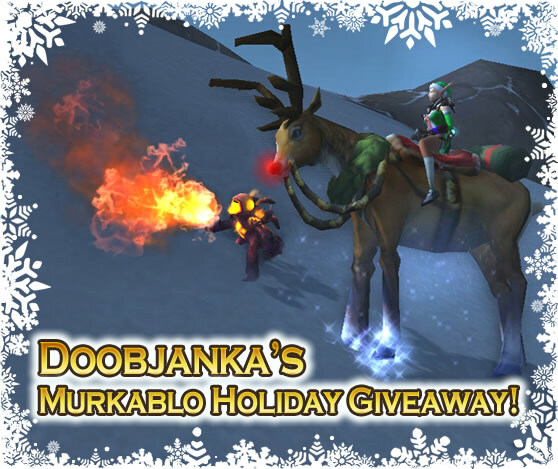 WarcraftPets' own Doobjanka is giving away TWO Murkablo pets to commemorate his four years of volunteering for WarcraftPets, and to celebrate The Feast of Winter Veil. For a random chance to win your very own Murkablo on Winter Veil morning, simply post your idea for a new Winter Veil pet. Include the name of your pet, a brief description of its appearance, and three (3) festive abilities that it could use to trounce other pets in battle! Remember, only one entry per person. If you have multiple user accounts, choose one to post your official entry. Multiple entries by the same person will disqualify all entries. However, you may freely edit your original entry before the close of the contest. Entries must be posted no later than 11:59 PM EDT, Tuesday December 24, 2013. Two winners will be randomly selected the following morning.